Create Some Seriously Vibrant And Creative UV Portraits! 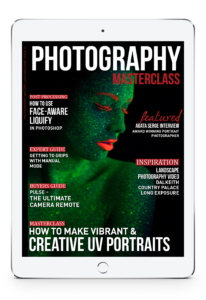 Find Out Exactly What It Takes To Get Great Results With UV Photography, And Create Some Seriously Vibrant And Creative Portraits, In This Issue of Photography Masterclass Magazine! Sometimes it's great to experiment with something completely different, and UV photography is just that. Using a selection of UV lighting and UV products, you can create some seriously vibrant and creative portraits. In this issue we look at exactly what it takes to get great results with UV photography! + Kevin Roberts' video takes us behind the scenes of his most recent photo, where he finds an unusual perspective by photographing a palace from behind a bridge. + In our expert guide, we look at exactly how you can make the move into shooting in manual mode. + We interview award winning portrait photographer, Agata Serge, who is most well known for her unique black and white portraits of women with freckles. + You'll learn how to adjust facial features using Face-Aware Liquify tool in a great Photoshop video tutorial. + We showcase an incredible timelapse film that showcases some amazing sky shows captured over a period of 6 years! + We also give you the lowdown on the Pulse camera remote – billed as the ‘Ultimate' in camera remotes, and you'll see why.